We have talked about many different pieces of golf gear and golf products that individuals need. However, it is the simple items that sometimes make a big difference. For instance, how well would you play the sport without using those alignment sticks you bought for the holidays? How about your new moisture wicking shirts, they are comfortable right? Well, what if you want to keep your water bottle, energy drink, or can of beer cold while you are aiming for a hole in one. This is what a koozie is for! Even though it is a very comical word to mention, a koozie happens to be one of the best inventions since bread and butter. In all reality, no individual wants to a drink a flat and warm beer. Therefore, the koozie was made to ensure that you never have to drink your beer quickly or risk it getting warm. We went on the search to find and share the top ten best koozies in the industry. These are all designed to be high quality, they are funny and different, and many of them even come as a value pack so you can share them with your neighbor and friends. So, let’s talk about the top ten best koozies and what the industry offers as far as design and material quality. If you are looking to keep your beer or water bottle cold, it is time to talk about the best koozies. This product is designed to be of high quality, a great gift, and very efficient to use. With a fun construction design and durable qualities, this is the SandT Collection Golf Koozie. Yes, it is themed like a golf bag! Here are two design features. This product comes with a double wall construction that is designed to be high quality, easy to use, and effective. The double wall construction is efficiently constructed to be durable and even comes with a keychain that allows the user to hang it from their keychain. The overall design is very modern and simple. The design of this product happens to be a multi-use construction design that fits most cans and bottles. To add to this, an individual can easily use it with a beer or a water-bottle. The construction is also very durable, making it easy for an individual to use it with multiple sizes. The overall construction feels very sturdy too. Nothing is worse than a flat and temp beer. 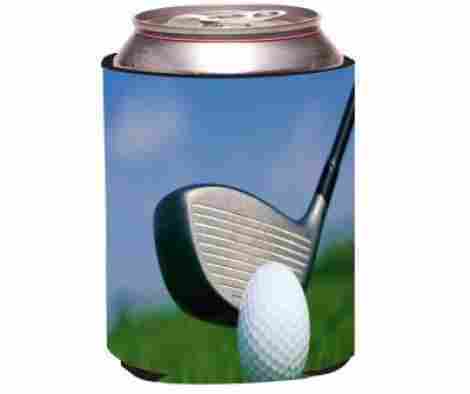 With that, if you want to keep your bottle warm on the golf course, a golf koozie is the best product for you. Overall, people can expect the design to be top quality, durable, and can fit most cans and bottles. You can buy one, three, or nine, and they are priced very well. Don’t forget that they are golf themed, so very suited for the course. Top quality gift and design. Stitching may come apart after a long time of use. If you are looking for a koozie that shows your love for the Packers, this is it. This product is an olive green color with the bright Packers logo and it is designed to fit in your car, truck, golf cart, and more. This is the next product on our list, the Kolder Green Bay Packers Kaddy Holder. Here is the first benefit of this koozie. The design is this product is very high quality and simple. The design is a 3mm neoprene collapsible design with a wetsuit rubber feel on the inside. The exterior is a felt material and it is designed to not sweat and be anti-slip. With that, the construction is highly durable, easy to use, and convenient. A koozie is regularly easy to pack. However, some are not collapsible or easily fit into the glove compartment or any cup holder. So, you can easily take this with you on the golf course or keep it in your stand bag or duffel bag. The overall construction is convenient and durable. As far as the price, we want to share with our audience that this product is convenient and very simple. 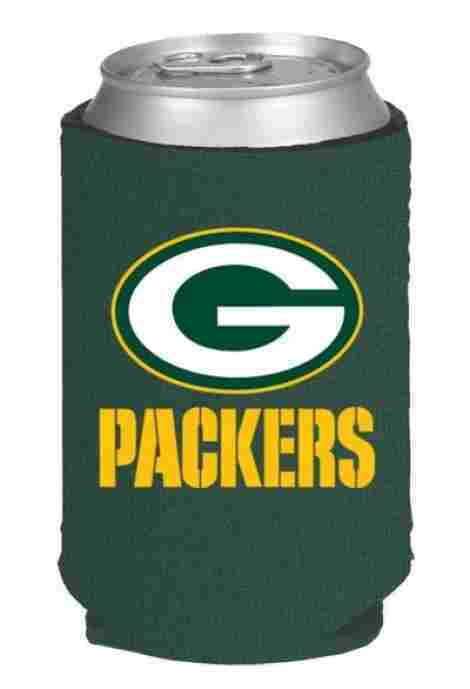 It is the fact that it comes with the Packers logo that makes it a more modern and fun koozie. If you have a friend that is a fan of the golf course and the packers, this is the koozie to get. The price is under $10. 3mm neoprene material is durable. Will easily fit the console of your car. Great gift for many individuals. The product may have a strong rubber scent at first. This next product is made for individuals that want novelty koozies that are high quality. This is the BigMouth Inc Koozie and it comes in a variety of cool novelty design. If you are a fan of photography then you can get the camera design and there are two other fun designs to choose from as well. Let’s talk about the design features of this product. This product is designed with an insulated material design that is high quality, efficient, and durable. The overall construction is made of a high-quality foam that is effective in ensuring that your beer and water stays cold. With this, the design is very simple and can easily be cleaned. For the really fun golfer in the family, this makes an excellent product with plenty of fun qualities. The design is a simple and durable construction that is designed to make a great gag gift. Whether it’s for a birthday, a holiday, or simply a fun gift, there are different varieties to choose from. This product is simple and durable. The price is a bit higher because it is a gag gift, but overall, individuals will appreciate the construction and durable qualities. With that, it has a genuine guarantee and this brand ensures that you are getting the real deal. Lastly, they have an average of four stars and plenty of positive reviews. Insulated material keeps drinks cold. Does not leak or sweat. Time to talk about a quality koozie made for golfers. This is the Rikki Knight Golf Ball and Tee Design Drink Koozie. This product is durable, simple, high quality, and designed to last. Most importantly, it keeps your beer cold and your drinks cold. With a comfortable design and cushioned grip, here is the first benefit of this product. Individuals are proud that products made from this brand are made in the USA. Therefore, they are not lesser quality. They happen to be durable, they do not pill easily and the color will not fade. The overall construction is efficient, designed to last, and convenient. Also, it is properly designed for insulation, durability, and convenient carry benefits. This product is designed to keep your hands dry and warm. Essentially, if your drink is super cold, you do not have to worry about your hands being cold as well. It keeps beverages cold for long periods at a time and the design will keep your hands warm due to the premium neoprene construction qualities. With that in mind, the overall design can fit a 12oz soda or beer. In discussing price, this product is effective, durable, and well constructed. To add to this, it keeps beverages colder for longer and the overall construction can easily be washed. The price does not include shipping and it currently has minimal reviews. However, the brand is trusted and they have come to be known for their convenient product designs. Excellent stitching on the side. Keeps your hands dry and warm. If you are wanting a quality construction product for you and the whole team, this is it. This is the Avery Barn 10 Pack Funny Quote Koozie Sleeves. They are high quality, convenient, durable, and come with a durable insulated 3mm design that is made to be convenient and high quality. With that, the sleeve cover is made to be durable, and you can give one to every member on the course! This product comes with a great grip construction design. The great grip construction ensures that the user will be able to easily use the product and conveniently be able to hold it without fear of it sweating or slipping. The exterior feels more matt, but it is also cushioned for added comfort and design benefits. It has been commonly known that neoprene is an effective and high-quality material. Well, this product comes with a 3mm neoprene construction that is efficient, durable, and keeps your beer and water bottle cool for long periods at a time. To add to this, this product is a perfect fit with a great quality construction grip for efficiency and comfort. As far as cost and benefits, the biggest benefit is that for the price, you get ten high-quality koozies. The design of this product is very enjoyable, and it has some of the funniest quotes. Overall, you can match a quote to the personality of each individual and enjoy a fun game of golf and beer together. For the price, this is a high-quality design. Most importantly, the brand actually has five stars and plenty of positive reviews. Value pack is priced very well. May leak or sweat some. 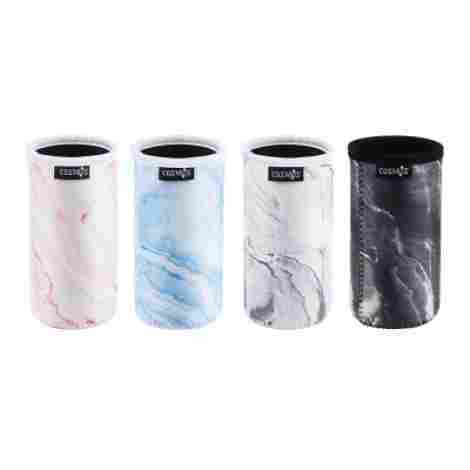 This next product is the Cosmos 4 PCS Neoprene Slim Can Sleeve Insulator and it is high quality, simple, and designed for slim cans of beer or energy drinks. If you want a high-quality koozie that is aesthetically very pleasing, this one is worth considering. This design is simple, high quality, and efficient. 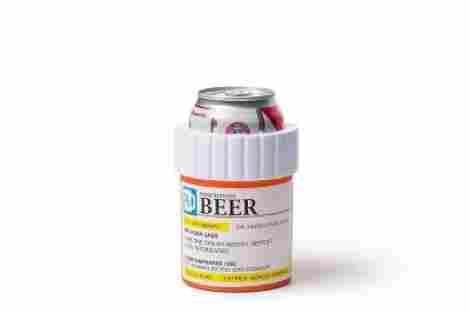 Overall, individuals will discover that it is a very fun koozie to consider. This koozie pack is a value pack design for individuals that want to match their koozie to their golf style or share them with other golfers. 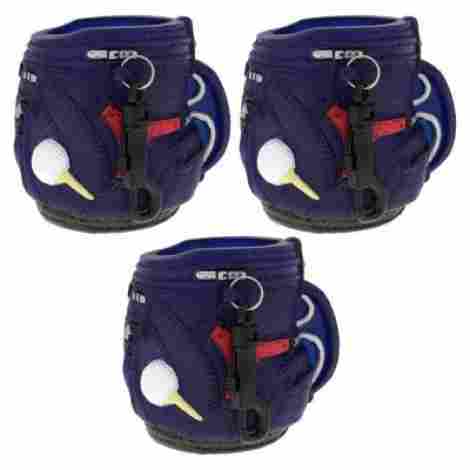 If you are leading a team of four individuals on the golf course and want them to all have their drinks nice and cold, this is the set to get. Now, they are designed for a specific can or drink design, but they work very well and are very efficient and high quality. The design of this product is a highly effective and quality design. It comes with a stitched fabric seam on the top of the sleeve that makes it sturdy and very durable. With this, the stitching is double cross stitched to ensure that the sleeve does not come apart and it keeps your content cool for a long period at a time. This is a very high-quality construction design and benefit. What makes this set incredibly appealing is the fact that it comes as a marble set. The whole set resembles marble or granite and it comes in four color choices that are very aesthetically pleasing. So, there is one for the whole family on the golf course. With that said, the set is a bit above ten dollars, making it incredibly affordable. High quality set to consider. Comes with double stitching design. Value pack of four for great price. Not as good as double insulated designs. 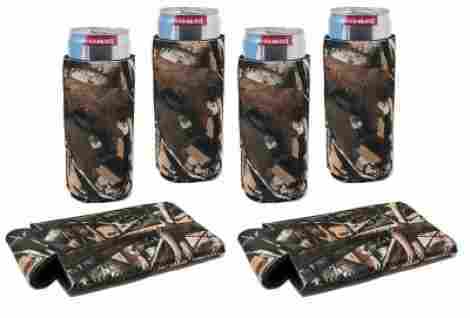 The next set of koozie sleeves are for individuals that would like a camo and more natural design. If you do not find the marble blue or pink design very appealing, then this next set is the right set for you. This is the Tahoe Bay Slim Can Sleeve Camo design and it is a very high-quality koozie with quality guaranteed. The overall construction is durable and stitched to last. This product is designed by an authentic company known as Tahoe Bay. In fact, they are a U.S. Veteran owned family business in California, near Lake Tahoe. With that, they focus on customer satisfaction and product quality above anything else. They have designed their products with a 100% quality guarantee to ensure that customers like their products and find them to be useful and high quality. Overall, we want to share that this is an excellent company to consider. If you are not a fan of the camo design, they also have a wide variety of color choices to choose from. You can pick between all black, all pink, and all white, alongside other different choices as well. With that, the design is efficient, high quality, and durable. Overall, individuals can expect a lot of variety alongside being able to personalize them to their choosing. One of the best aspects of this brand is that you are investing in a quality brand with plenty of years in the industry alongside being family owned. With that, they have designed for their products to be durable, efficient, and high quality. Individuals can enjoy a nice cold drink on the golf course knowing that their investment is going towards a family owned business with an emphasis on veterans. The price is also well below many other brands. Quality brand and family business. Personalize them to your choosing. May not fit thicker cans. If you want to the be the funny guy of the group and bring along your favorite koozie with your name on it, this is the product to get. 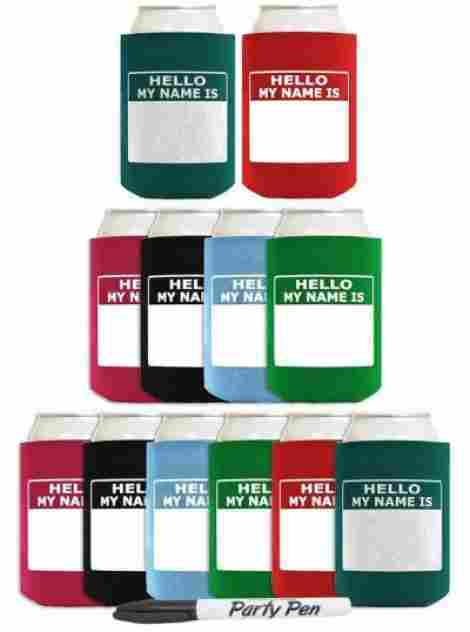 With this style, you can write your name on the koozie so everyone knows that it is your drink. With that, you can get a multipack with multicolor designs in the case that you are gathering the whole team for the golf course. With that said, this is the perfect icebreaker for a fun day on the course. This is the ThisWear Funny Hello Koozies. This product, like many other koozies in the industry, is designed to be very high quality. More so, it happens to fold flat and be collapsible for easy storage. Therefore, an individual can easily store it in their golf stand bag or duffel bag and take it out whenever they are ready for their golf drink, just remember to bring your cooler! This product is made of a material known as polyurethane foam, which is a synthetic foam material that is designed to keep products warm or cold. With that, both sportswear clothing and many other gears are made of this material. 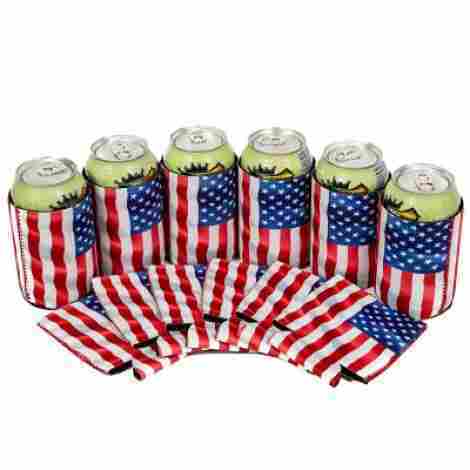 These koozies are made of this material because they are intended to keep the can cold for a long period at a time. The thickness is 1/8” thick and designed to keep your drink cool. The cost and the value for this product are due to the overall high-quality design of the product and the fact that you get a large selection of different colors and quantities. With that, they have 4.5 stars and plenty of positive reviews. Overall, this is a family pack for individuals that want to head to the golf course or the game with their favorite beer in hand. Foldable and easy to store design. Includes a blue or black party pen. Holds 12oz cans or bottles. Different quantities to think about. The pen may run out quickly. This next brand is a quality brand with close to five stars and plenty of quality reviews to consider. What makes them even better is the fact that they have the largest collection of koozie designs that we have encountered so far. If you want a quality brand with years of experience, we recommend the QualityPerfection Variety Pack. Here are two great reasons why they are worth considering. The material of this quality item is made of neoprene. The neoprene construction is durable, high quality, effective, and works very well. With that, it is sewn with a double stitch construction that is intended to last and designed to be rip and tear resistant. More so, the design is convenient, and the neoprene construction causes the product to not leak easily. The design of this particular product is collapsible and makes it easy to store. A user can expect that it will not take up too much space in the pantry or in the golf stand bag. Overall, the design is durable, effective and intended to last. Individuals will like that the construction is efficient, and the stitching is trustworthy. To discuss the cost and the value for this product, an individual will notice that the design is durable, and the construction is efficient. More so, the overall quality pack is priced very well. You can select between different designs and colors and different variety packs to choose from ranging from only two up to twelve. With that, the price is very convenient. Comfortable to hold and does not leak. Can be a bit tight for certain cans or bottles. If you are a novelty kind of golfer, then you will like this really funny koozie design. 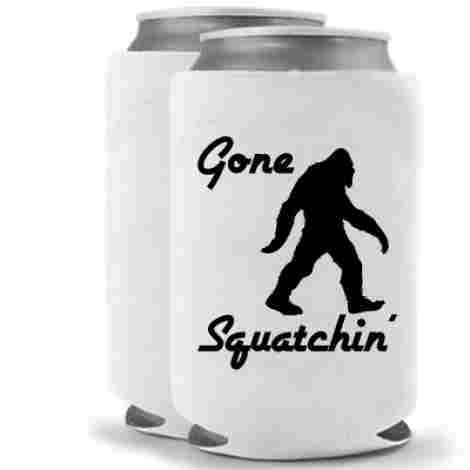 The Gone Squatchin koozie is for individuals that want a funny neoprene koozie to keep their beer and drinks cold. With that, it is a simple design with a quality and durable design to consider. This item is made 100% in the USA. Therefore, a user can expect the design to be durable and high quality. More so, the construction is effective and designed with a premium neoprene construction. Individuals will like that the design is also cushioned and designed to not leak. The design of this product is made to be flexible and easy to wash. Users can both easily store this product due to the collapsible design and also easily wash it. With that, it is sleek and very comfortable to hold for long periods at a time due to the construction. To discuss the cost and the value, users will appreciate that the design of this product is very simple to hold, easy to use, and even machine washable. Many other koozies are not machine washable, but this one is. With that, this is the only design available so it’s for a particular individual that wants a comical koozie. So, which of these koozies is the one for you? Whether you want a simple quality koozie for the golf course or one for your slim can of beer, there are many different styles and variety. With so many different styles and variety, how do you know which one to choose? Well, this is where the criteria used in evaluation comes in. If you are seeking a quality method to get to know more about the different design styles out there, we want to share with you the method. Let’s talk about the criteria for selecting a quality can cooler and what users can learn from the different variations out there. With that, this criteria is also what helped us pick the top ten best products and identify which brands to include in our list. Let’s begin! When selecting a quality koozie, our intention was to focus on products that were made with four stars or above. With that, many brands we shared may not have had a rating but their overall quality and design in other products suggest that they are an expert in creating this one. Overall, reviews and ratings are important when considering a product because they allow us a bit of insight into the product design of the item and how well it is constructed. Overall, we want to share that the reviews for the products we shared were expertly designed to be made of quality materials and durability. Which brings us to the next criteria, let’s discuss the build quality. The build quality of a koozie is a very important element to consider for various reasons. With that, we want to focus on two different aspects of the build quality that individuals will want to keep in mind. Let’s discuss the first aspect, the most common materials used to build a koozie. As this first aspect, the material may be the most common and important factor to consider. As far as material, neoprene and polyurethane are the two most common materials in which the interior material of a can cooler is made out of. The reason being is that these two materials keep heat for a long period at a time or keep an item cool for a long period at a time. They do not allow for the transfer of temperature from the outside into the inside and vice versa. With that, they are also sweat-resistant and designed to be of high quality. However, another factor of material is the outside material. The outside material of a can cooler can be designed from felt or similar material. This allows for the printed design to appear easily on the koozie and for it to also be slip resistant. As the next factor, the stitching was another important element to keep in mind. The reason being is that we wanted to ensure that the stitching of the koozie was well designed and durable. Most brands focus on a double-cross stitch design which is guaranteed to last and makes the overall product design more durable and high quality. With that in mind, the stitching allows the design of the product to last longer and also not come apart when its being machine washed. Now that we have discussed the build quality, let’s move forward and talk about common features to consider. This is a very simple criterion, but we wanted to die into the common features to consider when selecting a quality koozie. So, let’s dive into what are common features of many of the brands and can coolers we shared above. This is a very common feature. Unless it is a novelty and stainless steel koozie like the first one on the list, they all tend to be collapsible and easy to store. The reason being is that the material quality of many of these products is actually neoprene, which is highly flexible and easy to use the material. So, individuals can expect many of them to be collapsible. The exterior design of the can coolers tend to be non-slip, allowing the user to get a good grip on them. This is due to the exterior material design of many of them. With this, the user can expect that the koozies will be made to be very high quality and slip resistant, so they are easy to hold for long periods at a time. Another very common feature is for the product to be sweat resistant. Essentially, the interior material design of the koozie is designed for water to not penetrate the foam material. Therefore, an individual does not feel the excess of condensation on their skin. With that in mind, this is a very high-quality feature and design of many brands nowadays. 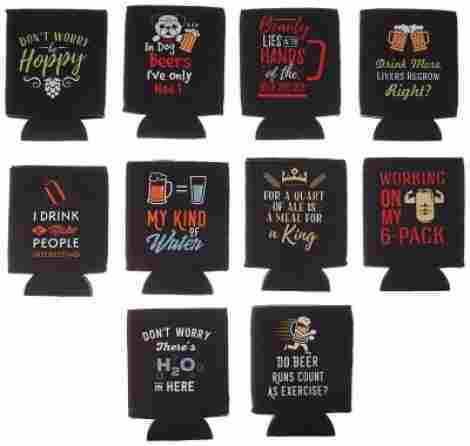 As the last aspect to consider, this last criteria is a short selection of other aspects that we wanted to keep in mind when selecting the best koozies. Let’s discuss a couple of different factors in selecting a quality product. The size was a very important factor to consider. The reason being is because we wanted to share different sizes and thicknesses to consider. Therefore, individuals should take into consideration what kind of size if the best for the kind of drink they want to drink and have on the course. There are koozies for slim cans, regular cans, and oversize bottles or drinks. Another important factor of the criteria was the design and the aesthetic appeal. With this, we shared a wide selection of different styles to choose from so individuals can select the one they feel most suited for. With that in mind, you can have your pick of solid color or comical, luxury marble or camo! The cost and how many are a part of a pack is the last factor to consider. With this, many brands have a value pack where an individual can purchase more for less. So, everyone on the golf course can have their drink nice and cold. With all of this taken into consideration, let’s chat about some of the most asked questioned. Q: Can you machine wash the koozie? Actually, unless it is made of a double wall construction or stainless steel, yes. The neoprene or foam construction of the koozies are machine washable. However, you want to place them inside of the washer, not the dishwasher. With that, always read the instructions to ensure that you wash it correctly and the color does not fade or the stitching come apart. Q: What is the interior made out of and does it rip? The interior material of a koozie is most likely made of polyurethane or neoprene. With that, these two material qualities are designed to be high quality, durable, and allow for the product construction to be virtually tear-proof. Unless you hack at your koozie, it will be fine! Q: Does the exterior color fade? The exterior material is a stitched or dyed color fabric. Therefore, it should not fade easily and it should stay looking brand new for years to come. With that, ensure that you wash it correctly and you will be fine. Q: How long does it keep my drink cold? It is not like a double insulated tumbler or coffee mug, but it will keep the drink cold for a couple of hours by limiting the transfer of heat from your hand to the can. Most importantly, your hand will never be exposed to the cold can or hot drink.